Which Vitamins & Minerals Do Walnuts Have? Warm milk may be replaced with eating a few walnuts before going to bed to help you fall asleep. 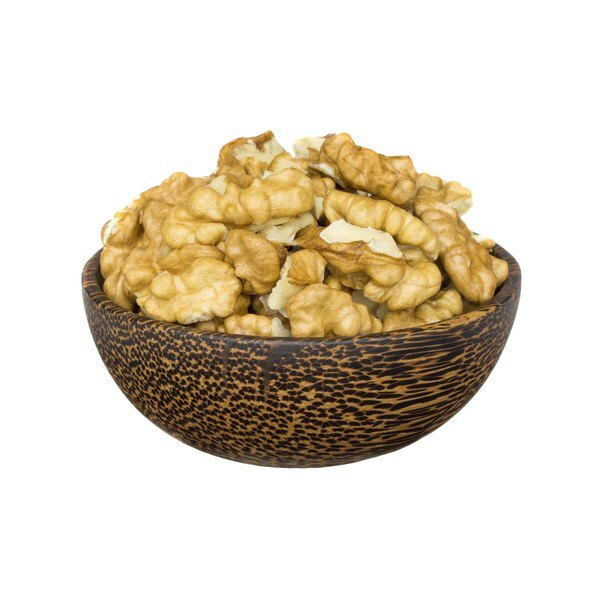 Walnuts contain melatonin, an antioxidant that naturally occurs in the body that makes you feel drowsy at night. If you have insomnia, do not use any food, herb or medication to help you fall asleep without first talking with your doctor. Walnuts are not intended for everyone because of a possible allergic reaction and should be used for medical purposes while under your doctor's supervision. Walnuts are a tree nut that has 15 different species grown in Europe, North Africa, East Asia and North America, according to Drugs.com. The oil from walnuts has been used traditionally to treat colic, diarrhea, hemorrhoids and to soothe the intestines. Folk medicine has used walnuts as a disinfectant, an astringent and to treat ulcers, blisters, sunburn and dandruff. Walnuts are not regulated by the FDA as a medication for effectiveness, potency and purity. Melatonin is secreted by the pineal gland in the brain that helps to regulate hormones throughout the body. Melatonin is the primarily chemical in the body that helps regulate your internal clock. When it’s bright outside the brain produces less melatonin and when it gets dark, melatonin levels increase in the body to help you fall asleep. According to a study performed by the University of Texas Health Science Center, 1 g of walnut contains between 2.5 and 4.5 ng of melatonin. The University of Maryland Medical Center states that the average adult dose of melatonin to help with sleeplessness is between 1 and 5 g daily. Eating walnuts is not a suitable treatment for insomnia. Insomnia is a medical condition that prevents you from having restful and consistent sleep. MayoClinic.com defines insomnia as taking 30 minutes or more to fall asleep for less than six hours, three or more times in a week. Common symptoms of insomnia include consistently waking up in the middle of the night, waking up too early, tired in the day, irritable, depression, tension headaches and difficulty staying focused. Treatment for insomnia needs to be decided by your doctor after a medical evaluation. Walnuts are considered a highly allergic food, which can trigger an anaphylactic reaction in some people, according to the Food Allergy Initiative. If you have a tree nut allergy, you should avoid consuming walnuts because a severe allergic reaction can lead to death. Common signs of an allergic reaction include shortness of breath, increased heart rate, nausea, vomiting, hives, eczema, skin rashes, sinus congestion and facial swelling. What Are the Dangers of Drinking Black Walnut Tea?